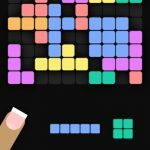 Gridblock is an immersive puzzle game that’s available for Android and iOS mobile devices. To be more specific, it’s an intuitive and challenging puzzle game that’s meant by the creators to test and tease your brain. You can play the game at any pace, as you try to train your brain, develop your mental skills, and stay “mentally fit” at all times. The developer goes on to say that you can play this game and relax, even if you’ve got only a few minutes to play. So how does this game work? Well, you will have to fill the grid with blocks, forming rows and columns and clearing the lines once they’ve filled up. You’ve got to avoid the gridblock at all costs in order to keep on playing, and make sure you don’t run out move. 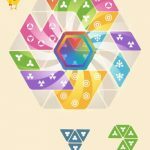 In other words, it’s a bit similar to Tetris, albeit a completely different kind of puzzle game that’s still simple enough for most people to enjoy. With that said, let’s get down to our list of Gridblock tips and tricks that should allow you to pick up the game quickly if you’re a first-time player. While you might not have a hard time dealing with the puzzles and clearing lines at first, the game will start becoming difficult when the board starts filling up. 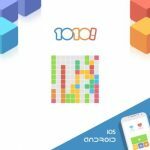 Unlike conventional Tetris, where you can only clear horizontal lines, you can also clear vertical lines here, which is a good twist on a classic game; clearing horizontal and vertical lines alike will free up more space for blocks, and also boost your score. Better yet, you can clear more than one line at a time; these “combo” moves will, of course, clear off more space than a single-line move would. Generally, you’ll want to avoid the middle of the board, and to do most of your work around the corners. Doing that will have you occupying less space, and prevent you from leaving big gaps in between blocks. 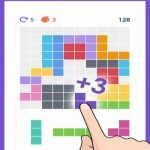 The challenge of the game is that you will somehow keep on seeing gaps, but the trick here is to delay those gaps so that you can last longer and score more points in the game. Why should you care about the blocks that have stars on them? Well, if you clear them while clearing out a line, you will earn coins. Coins are the game’s main form of currency, and you can also earn them by heading to the offer wall and completing offers to earn more coins. Fortunately, there don’t seem to be too many impossible challenges in the offer wall; you can choose the ones that allow you to download a game or app in order to earn coins. You can always uninstall the game once you’ve redeemed your coins. The option to pay real money to make in-app purchases is there, but then again, that’s something we’ve always wanted to help you avoid. Part of the challenge of this game is the fact that it won’t tell you anything if you’ve run out of moves. And if you don’t have any more power-ups to use or coins to do a quick switch-out, it’ll be game over for you. Still, you can simply press on the reload button and stert a new game from scratch, and your last score will still be credited as the high score, if it qualifies. Last, but not least, let’s talk about the power-ups you can buy in this game. You can buy them once you’ve earned enough coins, and they act like special pieces do in Match 3 games. For example, the Shuffle power-up literally shuffles the blocks on the board, while the Bomb clears any block within one block of the one you tap on. Clear R and Clear C, respectively, pertain to clearing one row and column. The simple old Blocks power-up replaces your current blocks with a new batch. And lastly, Nuke destroys all blocks within two blocks of the one you tap.